Rice’s Point, like Minnesota Point, is a large sandbar created by silt carried toward the lake by the St. Louis River. It had been a summer home to some local Ojibwe—and the location of at least one native burial site—for at least 100 years before Superior pioneer Orin Rice moved his family across the bay in the spring of 1854. Soon after he filed a claim on the peninsula that jutted into the bay west of Minnesota Point and east of Oneota. Rice then operated a ferry service between Superior’s Conner’s Point, Minnesota Point, and the peninsula he had claimed, which in 1858 would be platted as Rice’s Point. The township stretched from the end of the point north to Point of Rocks and included a great deal of what would later be called Duluth’s West End. Rice had big ambitions for his township, and attempted to have Rice’s Point made the St. Louis County Seat—even temporarily changed its name to “Port Byron” to give it a more glamorous appeal. His efforts failed, but the Minnesota Territorial Legislature did give him the sole rights to run his ferry service across the Bay—and state lines—to Connor’s Point for fifteen years. 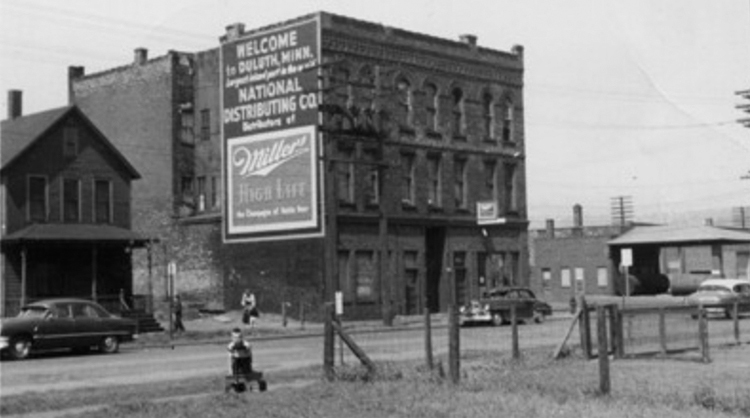 Duluth’s geography would seal the fate of Rice’s Point as an industrial district. It was the home of Duluth’s first blast furnace, and once the canal was cut, its eastern side would be developed into slips. It would become the site of coal docks, grain elevators, and lumber yards. West of Garfield were the railroad yards and, later, a scrap-iron yard. Many other industrial businesses operated on the point, many along the northern portion of Garfield Avenue. Rice’s Point was also home to Duluth Water and Light at 520 Garfield Avenue, which included one of the point’s most visible landmarks, a 3 million cubic foot “Gasometer” holding tank. Designed to hold coal gas, the “tank” was actually a large, cylindrical metal cage that contained an immense bag into which natural gas was pumped and stored. Most of Swede Town’s early residents were actually Finnish. While most of Duluth’s early Finnish immigrants set up housing on Minnesota Point, in the late 1880s Swedish-speaking Finns or “Swede-Finns” first settled in Duluth on Rice’s Point along what was platted as Garfield Avenue—merely sand dunes at the time—and along two streets east of Garfield above the 600 block. According to historians, some of the Swede-Finns also lived on a tiny nearby isthmus in St. Louis Bay east of Rice’s Point called “Grass Island,” adjacent to what was platted as Elm Avenue, the street dividing the 700 and 800 block of Garfield Avenue. Swede Town first developed after 1886. That year there were no boarding houses on Rice’s Point; two years later there were eight of them. By 1900, another four had been added. That same year residents had moved off of Grass Island to make room for the Peavey Grain Elevator, the first concrete grain silo built in Duluth and the largest in the world when planned (by 1910, the Zenith City boasted ten of them). It was built on the eastern edge off Rice’s Point between Elm and Lynn Avenues. Not all of the neighborhood’s residents were Swede-Finns. In fact, by the 1910s most of Rice’s Point’s Swede-Finns had relocated to the West End, but many low-income families of Finns and other ethnicities continued to live on Rice’s Point, including Norwegians, Danes, Swedes, Poles, and Assyrians. Long before that the enclave had become known less as Swede Town and most often as the Garfield Avenue Neighborhood. The citizens along Garfield Avenue were far from wealthy. A newspaper story from the 1890s tells of a man and his four daughters living in a house on Garfield Avenue that consisted of just two rooms, one for cooking and eating meals, the other for all five of them to sleep. Residents included such immigrants as August Signer or “Water August,” a bartender who tried his hand at the fresh-water delivery business, using an ox to haul fresh water drawn from St. Louis Bay from Rice’s Point to the West End and charging his customers a nickel a pail. Signer was an example of the way the community took care of its own. In the months prior to his death, Signer and his wife Hilma—who had five children—welcomed Sophia Aho into their household. Miss Aho was a single woman who was convicted, and then acquitted, of stealing money from a home on South Lake Avenue. The Signers took her in until she could find a job and establish a home of her own.